My office building is freezing. Not just cold, I’m talking arctic temperatures. I have to use an ice scraper on my computer monitor to be able to see what I’m working on. It’s cold. That’s how I turned into Mister Rogers, may he rest in peace. You remember Mister Rogers, don’t you? Good. If not, a crucial part of your childhood is missing and you should go Wikipedia him this instant. 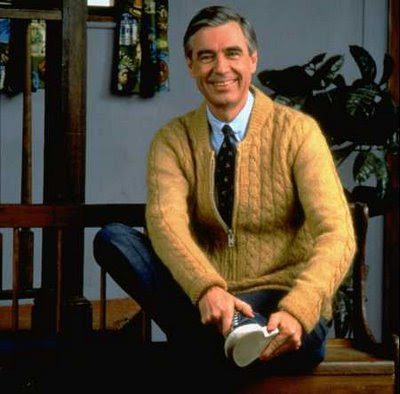 Mister Rogers was kind of famous for his sweater change at the beginning and ending of each show. I have my own sweater change now, which started because my office was so cold I would just sit and work in my heavy outside coat all day. I’m sure it looked ridiculous but it was the only thing that was keeping me from dying of hypothermia. Then we all got together as an office and petitioned the building people and we got the temperature raised approximately one degree. I don’t have to wear my Eskimo parka but it’s still cold enough that I need something. I thought about getting a sweater but decided that I’m not that old, and obviously sweater vests are the much dorkier cousin of the sweater and are thereby guilty by association. Truthfully, my arms are what get the coldest. If they had something like a “reverse sweater vest” that was just thick sleeves you could wear on you arms I would totally jump on board that woolen train. Unfortunately they don’t, and even if they did, a reverse sweater vest would look markedly dorkier than a sweater vest. operation in reverse. There you have it: Mister Rogers. I’m not knocking Mister Rogers, I just hope no one sees me make the change because I know they'd laugh me to scorn. Mr. Rogers was a good guy, but certain elements of his show often made me uneasy when I was a child. 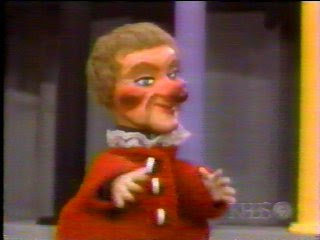 First, in every episode a miniature trolley would roll through, stopping long enough to “talk” to Mister Rogers before rolling away into the “Land of Make Believe.” Then the show would morph into some kind of fantasy world populated by weird people and creepy puppets. Growing up is weird, and now Mister Rogers is not even around to make me happy and uneasy at the same time. Thanks for hanging out. Simple theme. Powered by Blogger.